Harwin’s Gecko range was expanded to include screw fixings variations, known as Gecko Screw-Lok (or Gecko-SL). Developed to meet customer demand, the series features ruggedised screw fixings for increased security and can withstand repeated mating cycles without damage. 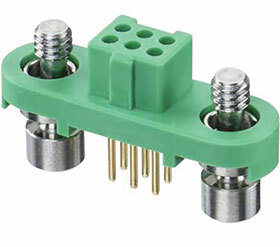 Up to 45% smaller than Micro-D connectors and up to 75% lighter, Gecko-SL delivers high reliability with a smaller footprint and increased flexibility for design engineers. Contacts are rated to 2,8 A individually and 2,0 A for all contacts simultaneously. Able to withstand 1000 mating cycles, they are ideal for long life or ‘fit and forget’ applications, in operational temperatures of -65°C to +150°C. Shielded options with machined aluminium backshells are available to deliver enhanced electrical continuity and effective EMI/RFI shielding in affected applications. The backshells are designed to accommodate flexible metal braiding and are strong and lightweight. Flexible cabling options include complete cable harnesses in customised lengths, loose mouldings and pre-crimped wires, and loose mouldings and crimp contacts.